Raymund and I met through World on a Plate (remember my meatballs and picnic post? ), where we each share recipes from our native countries each month. Needless to say, I was thrilled when Raymund asked me to guest post. Although he suggested making something representative of where I’m from, I’ve opted instead for a recipe from my current home. Living in Israel I have spent the last two years being introduced to new flavors, ingredients, and dishes and it was love at first bite. Israelis are diehard salad eaters, even with breakfast, and fattoush is one of my favorites. Its a pleasure to have you at Ang Sarap Katherine. This sounds heavenly! I love it! This looks so delicious – checking it out now! Lovely guest post Katherine, I just love this salad! On my way right now . . .
Fattoush salad is wonderful! I’m heading over to read your post now. 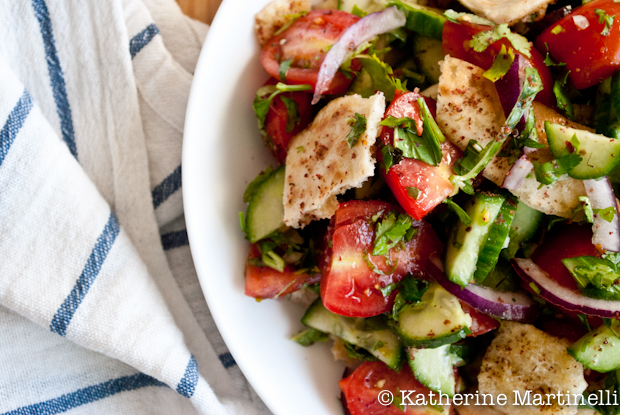 I’ve always wanted to try Fattoush Salad and this version looks perfect! Always order fattoush when we’re at a Middle Eastern Restaurant. I love it!